Technical data is based on sales brochures and data is valid for tractors/combines sold in Finland. Models with "ei FIN" are not sold in Finland and the data is taken from Swedish, German or British brochures. 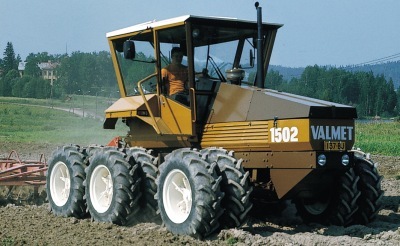 the main brands in the 60's/70's/80's were Valmet, Ford, MF, other important brands were Fiat, International, Leyland, David Brown/Case and Zetor. limited selection of brands sold in Finland: market share of Sampo is since beginning of the 1990's 60 % and Claas 30 %. Other brands are New Holland and John Deere. Earlier also Massey Ferguson (not Dronningborg made) and small models of Fahr were sold.